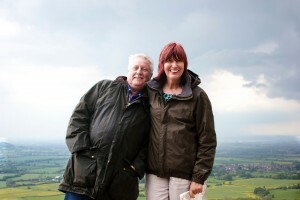 A Taste of Britain is a new BBC series presented by Janet Street-Porter and Brian Turner who visit different areas around the country to see the sights and try local delicacies and food specialities. An upcoming episode takes the duo to one of Janet Street-Porter’s favourite places – Kent. They explore Oare Marshes and historic Faversham before visiting one of the UK’s only snail farms near Canterbury which inspires Brian to make a snail frittata. The Goods Shed in Canterbury is the next stop for Janet and Brian, where chef Rafael Lopez creates a delicious lunch of lamb cutlets with vegetables using local ingredients. The pair also visits Brogdale near Faversham which is in the throes of peak cherry season and spurs Brian on to bake a stunning cherry pastry cake. The Oare Marshes Nature Reserve is located in the South Swale, in Harty Ferry, and has freshwater dykes, open water scrapes, reedbed, saltmarsh and a seawall which is favoured nesting place for many species of migrating birds. Previous productions which have filmed at Oare Marshes include Channel 4 drama Southcliffe (2013) and feature film Great Expectations (2012). The historic market town of Faversham has nearly 500 listed buildings and is home to Britain’s oldest brewery, Shepherd Neame. The area has many restaurants, shops and beautiful landscapes such as the picturesque Faversham Creek. Faversham has been previously seen on screen for productions such as Great British Railway Journeys (2014), Peter Andre’s 60 Minute Makeover (2013) and Our Food (2012). The Goods Shed in Canterbury is a popular Famer’s Market, restaurant, and food hall. Canterbury is a vibrant City which boasts the historic Cathedral, shopping areas, parks and open spaces as well as neighbouring quaint, traditional towns. Previous productions that have shot in Canterbury include Goodbye To Canterbury (2013), The Family (2008) and Last Orders (2008). The Kent episode of A Taste of Britain will be shown on BBC One on Monday 22nd September 2014 at 15:45. This entry was posted in Filmed in Kent and tagged A Taste of Britain film locations, Brian Turner, Brogdale Farm, Faversham, Janet Street-Porter, Oare Marshes, Snail Farm Canterbury, The Goods Shed, tv factual. Bookmark the permalink.